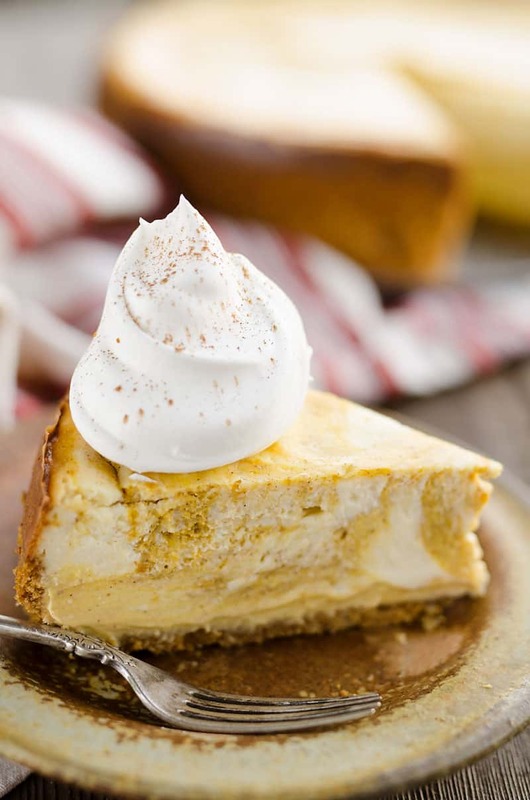 Pumpkin Swirl Cheesecake is a rich and delicious recipe perfect for the holidays! A thick New York style cheesecake is swirled with a sweet pumpkin mixture in a pecan crust for a festive twist on a classic dessert. You don’t have to make the hard choice between pumpkin pie and cheesecake at your next holiday meal. 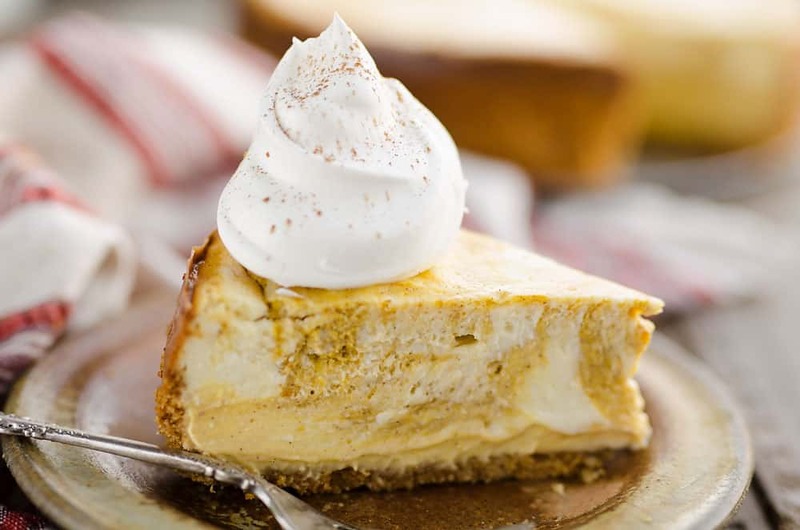 This Pumpkin Swirl Cheesecake is the best of both worlds! 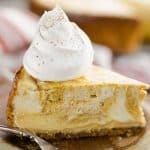 You get the creamy cheesecake texture with the rich pumpkin flavor all in one amazing dessert recipe. 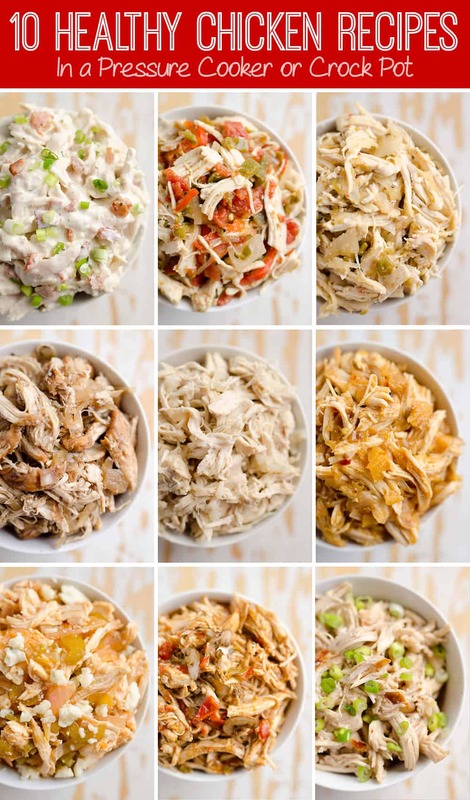 It makes a large batch so it is perfect for serving to a big holiday crowd as well! I used my mom’s go to New York Cheesecake recipe and swirled in some pumpkin puree and pumpkin pie spice for a holiday feel. I also added some chopped pecans to the graham cracker crust for added texture and flavor that pairs perfectly with pumpkin. I piled it all in a large 10 inch spring form pan and let it bake in the oven with a water bath. The beauty of making any cheesecake is that it needs to rest overnight for the optimal flavor and texture. 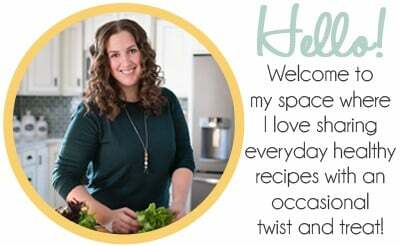 While this means you do have to plan ahead a day, it is great for a make ahead dessert. With the hustle and bustle of the holidays, there is always plenty of food to make on the day everyone is arriving. 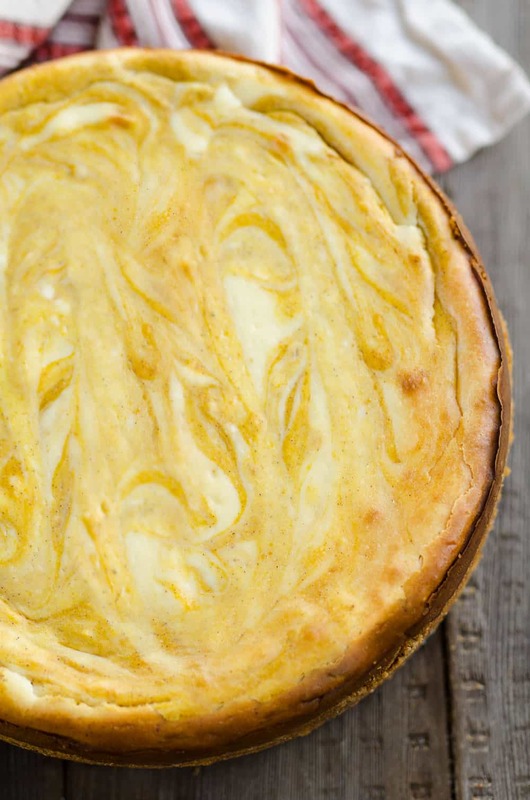 Make this Pumpkin Swirl Cheesecake a day or two ahead of time and cut out some of the stress! I made this cheesecake on a Sunday evening for a Tuesday dinner party and it was perfection. Top it with a little whipped topping or whipped cream and dust it with a tiny bit of cinnamon and you have a gorgeous and tasty dessert your guests will love. 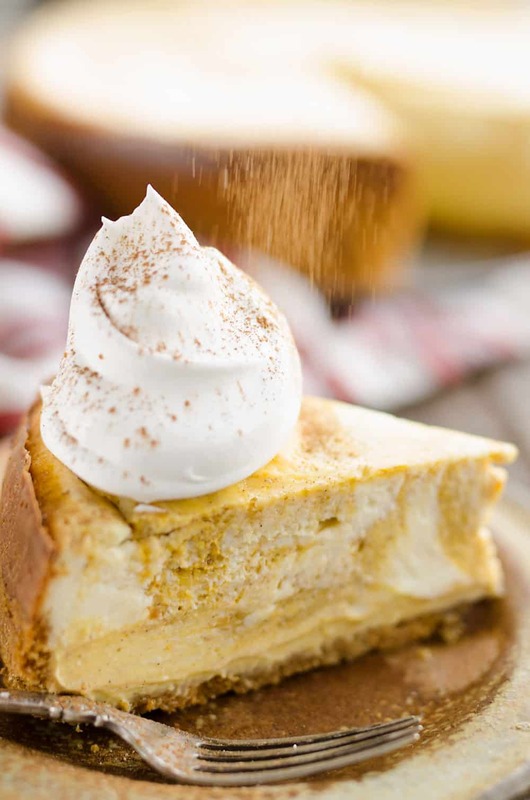 Whether you are entertaining for just your immediate family or hosting a friendsgiving, this Pumpkin Swirl Cheesecake is the perfect addition to any holiday dessert table! It is rich and delicious and will serve at least a dozen people! In a large bowl, combine the graham crackers, pecans, sugar and butter until the mixture is moist. Press into the bottom and edges of a non-stick 10 inch spring form pan. Bake 10 minutes at 350° and remove from oven. In a large bowl, beat the cream cheese, sugar, flour and vanilla at medium speed until well blended. Add eggs, one at a time, mixing at low speed after each addition, just until blended. Blend in sour cream just until mixed. Reserve 1 1/2 c. cheesecake batter into a small bowl. Add the pumpkin and pumpkin spice to the reserved cheesecake batter. Mix until smooth. 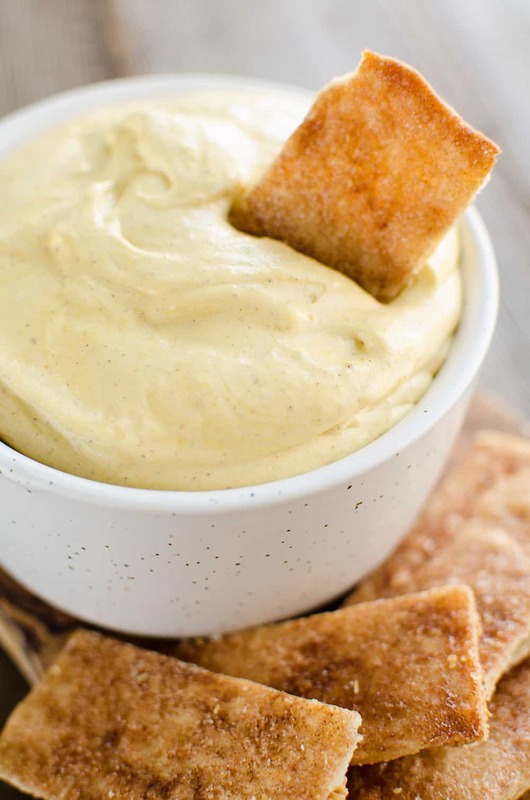 Spoon the pumpkin and cream cheese batters alternately over the crust. Cut through the batters with a butter knife several times to create a marble effect. Add a pan of water to the lower rack in the oven. Place the cheesecake on the top rack and bake for 65 to 70 minutes at 350° or until the center is almost set. Allow to cook to room temperature. Run knife or metal spatula around edge of pan to loosen crust. Refrigerate for at least 6 hours or overnight. Serve with whipped topping or whipped cream. 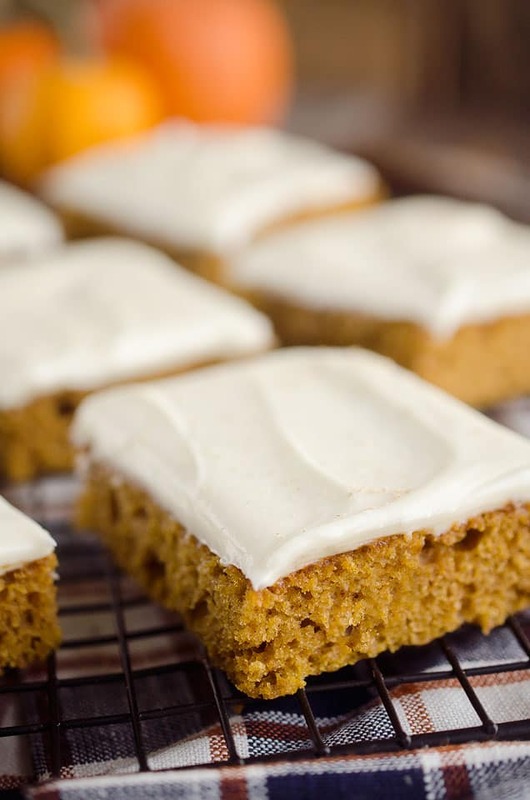 More great pumpkin dessert recipes! My husband would absolutely love this!! The swirls are so pretty too! 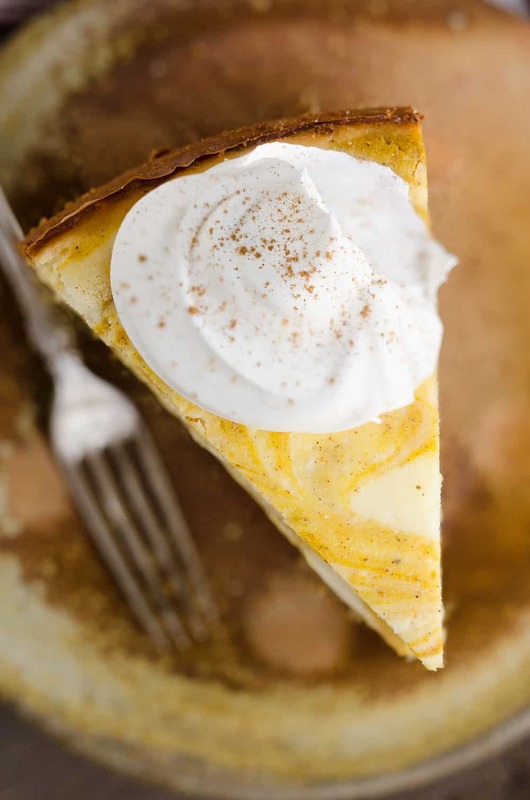 I have totally been wanting to make a pumpkin swirl cheesecake! Thanks for the recipe! I only have a 9in springform pan. How would I need to adjust this recipe for both ingredient amounts and bake times and temps? You would just need to increase the bake time a little. This cheesecake looks seriously perfect! That pumpkin swirl! The creaminess! I can definitely get behind a slice or two of this at the holidays! This is the best cheesecake recipe!! I made this for Thanksgiving and it was a total hit! !